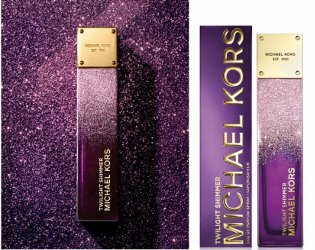 Michael Kors has launched Twilight Shimmer, a new fragrance for women. Twilight Shimmer follows 2016's Midnight Shimmer. Michael Kors Twilight Shimmer Limited Edition is an opulent new scent for a chic night out. The fragrance opens with lush red and violet fruits glimmering with sensual our [sic] and enlivened with a gourmand blend of lavish praline and creamy woods. Additional notes include plum and oud. Michael Kors Twilight Shimmer is available now at Lord & Taylor, in 100 ml Eau de Parfum, $108. A 50 ml size is also sold directly from Michael Kors. I like the purple bottle, but the name is making me think of My Little Pony.